It is hard to believe anything more catastrophic could befall Iraq with perhaps three million dead, between the strangulating 1990 onward embargo and the illegal 2003 invasion. Nearly five million displaced since 2003, destruction of the UNESCO Award winning education system, as access to electricity, safe water – access to normality. Destroyed or damaged by ISIS have been the eye wateringly haunting ancient sites in or near Mosul (dating back to 25th century BC), 3rd or second century BC in Northern Iraq: Hatra, 3rd or 2nd century BC; Nineveh, the Assyrian Capital; Nimrud, founded 3,500 years ago; Khorsabad, built between 717 -706 BC; the 4th century Mar Behnam Monastry. The 1226 CE (AD) Mosque of the Prophet Yunus (Jonah) and his tomb are no more and numerous other wonders are erased, as are museums and ancient literary treasures. Before ISIS, under US-UK occupation there was equal decimation under their bombs – and looting at their hands or under their watch. 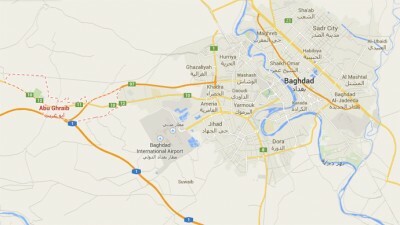 Now though comes a truly apocalyptic warning – that Mosul itself, Baji, Tikrit, ancient Samarra whose ninth century, golden domed Mosque was destroyed under US eyes (literally, since they were stationed there) on 22nd February 2006 and Baghdad, the “Paris of the 9th century” could be engulfed in a flood of literally biblical proportions. 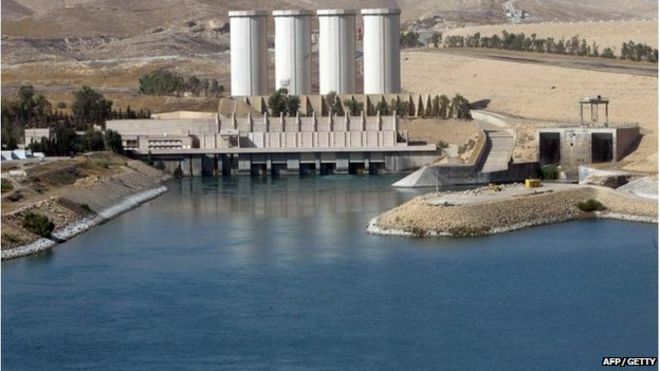 “Iraqi engineers involved in building the Mosul Dam thirty years ago have warned that the risk of its imminent collapse …” (1) All cities, towns, villages on trajectory of the great Tigris river below the Dam would be swamped, with Mosul engulfed within four hours in an estimated sixty five feet (twenty metres) of water. Estimates are that it is possible one million people could die by the time the tsunami reached Baghdad. The US is taking the threat seriously enough to have warned, on 29th February, all American citizens to leave the country should the Dam be breached. (2) How precisely the approximately 15,000 Baghdad US Embassy staff, a reported 16,000 mercenaries, plus other various spooks, special services, would make it from where ever they were to Baghdad airport before the deluge – and whether in the face of it flights would anyway risk coming in – seems not to have been addressed. Perhaps they could be helicoptered off the Embassy roof as in Vietnam. Incidentally the US Baghdad Embassy, the largest in the world, has swallowed up 104 acres of Baghdad and is nearly as large as Vatican City. It is situated beside the Tigris. Before it was built (completed in 2009) Embassy staff squatted in one of Saddam Hussein’s palaces. Those believing in natural justice might be pondering on Saddam’s revenge. The Mosul Dam (formerly the Saddam Dam) was built in 1984. Swiss designed, it was constructed by a German-Italian consortium. A fatal design flaw was the fact that it was built on porous bedrock. Nasrat Adamo, the Dam’s former Chief Engineer told the paper that only twenty four hour maintenance with constant grouting of the bedrock kept the Dam stable: “We used to have 300 people working 24 hours in three shifts but very few of these workers have come back. There are perhaps 30 people there now,” he said. The Iraqi government’s farcical “evacuation plan” is to simply advise everybody the entire length of the Tigris river, from Mosul to Baghdad (355.45 km) to abandon their homes, farms, businesses and move 6 km away, just like that. How? To where? The solution to the pressure on the Dam is to build a second one downstream as a further barrier, gigantic “filter”, in case of the catastrophic collapse. Ironically, under Saddam Hussein’s government a second one, the Badush Dam was speedily started – in 1988 – as environmental insurance just two years after the problems with the first Dam came to light, 20 km downstream. With the implementation of the US-UK driven UN embargo in August 1990 and Iraq importing about 70% of everything, the building materials were no longer available and the work on the Dam ceased. It has lain about 40% completed since. The Mosul Dam was taken over by ISIS on 7th August 2014, adding to fears of a catastrophe, it was looted, but regained by the Peshmerga and Iraqi forces on August 19th. In “assistance” the US-led coalition made nine airstrikes in the vicinity of the Dam. What further damage, fissures to the fragile, endangered foundations have been created from the massive vibrations of such brainless recklessness is not known. The bombing was in spite of a September 2006 report by the US Army Corps of Engineers warning: “In terms of internal erosion potential of the foundation, Mosul Dam is the most dangerous dam in the world.” On 30th October 2007 another report by the US Special Inspector General for Iraq Reconstruction (SIGIR) said that the Dam’s foundations could give way at any moment. Is there no intelligence, communication, joined up thinking amongst the US’ lethally armed forces? In spite of all, no US puppet Iraqi government since the fall of Saddam Hussein nearly exactly thirteen years ago, has done anything meaningful and apparently, in spite of countless $millions going missing, have had no money to address a danger of such enormity. Those struggling to maintain the Dam were at one point reportedly not paid for months. Finally after repeated warnings from experts and now $200 million from the World Bank, in December the government signed a contract with an Italian company, the Trevi Group, to address the massive technical problems, erosion and cavities under this vast structure with it’s current holocaustal potential. Italy has also agreed to send over four hundred troops to protect the site. The government is remarkably sanguine, with Mehdi Rasheed of Iraq’s Water Ministry quoted as saying that: “Downstream we can do many things.” (What exactly?) However: “In the current situation that is not possible for the people in Mosul city.” (3) The population of Mosul was around two and a half million, now with ISIS there and the current disaster the exact number is unknown – and clearly uncared about by the Baghdad regime. In April, in Rome, an international Conference is to be held to ponder on ways to avert this impending catastrophe. By then it might already have happened. Time for America’s latest proxy’s in Baghdad to get going and the Italians to get on ‘planes – pronto, before a great swathe of “The Cradle of Civilization” makes the unthinkable tragedy of the New Orleans’ floods of 2005 look like a paddling pool.